This page Western esotericism is part of the mysticism series. The earliest traditions to later be labelled as forms of Western esotericism emerged in the Eastern Mediterranean during Late Antiquity, where Hermetism, Gnosticism, and Neoplatonism developed as schools of thought distinct from mainstream Christianity. In Renaissance Europe, interest in many of these older ideas increased, with various intellectuals seeking to combine "pagan" philosophies with the Kabbalah and Christian philosophy, resulting in the emergence of esoteric movements like Christian theosophy. The 17th century saw the development of initiatory societies professing esoteric knowledge such as Rosicrucianism and Freemasonry, while the Age of Enlightenment of the 18th century led to the development of new forms of esoteric thought. The 19th century saw the emergence of new trends of esoteric thought that have come to be known as occultism. Prominent groups in this century included the Theosophical Society and the Hermetic Order of the Golden Dawn, which influenced the development of Thelema. Modern Paganism also developed within occultism, and includes religious movements such as Wicca. Esoteric ideas permeated the counterculture of the 1960s and later cultural tendencies, from which emerged the New Age movement in the 1970s. Although the idea that these varying movements could be categorised together under the rubric of "Western esotericism" developed in the late 18th century, these esoteric currents were largely ignored as a subject of academic enquiry. The academic study of Western esotericism only emerged in the latter 20th century, pioneered by scholars like Frances Yates and Antoine Faivre. There are now several peer-reviewed journals, university chairs, and academic societies devoted to this field. Esoteric ideas have meanwhile also exerted an influence in popular culture, appearing in art, literature, film, and music. Plato, in his dialogue Alcibíades (circa 390 BC), uses the expression ta esô meaning "the inner things", and in his dialogue Theaetetus (circa 360 BC) he uses ta exô meaning "the outside things". Aristotle applied this distinction to his own writings. The probable first appearance of the Greek adjective esôterikos is in Lucian of Samosata's "The Auction of Lives", § 26, written around AD 166. The term esoteric first appeared in English in the 1701 History of Philosophy by Thomas Stanley, in his description of the mystery-school of Pythagoras; the Pythagoreans were divided into "exoteric" (under training), and "esoteric" (admitted into the "inner" circle). The corresponding noun "esotericism" was coined in French by Jacques Matter in 1828 and popularized by Eliphas Levi in the 1850s. It entered the English language in the 1880s via the works of theosophist Alfred Sinnett. Since esotericism is not a single tradition but a vast array of often unrelated figures and movements, there is no single historical thread underlying them all. The developments that one might wish to emphasize in drawing up a history of esotericism furthermore depends on whether esotericism in the dictionary (non-scholarly) or the scholarly sense is intended. Several historically attested religions emphasize secret or hidden knowledge, and are thus esoteric in the dictionary sense, without necessarily being esoteric movements in the scholarly sense of the word. Thus, the Roman Empire had several mystery religions which emphasized initiation. Some saw Christianity, with its ritual of baptism, as a mystery religion. None of these are "esoteric" in the scholarly sense. The terms "Gnosticism" and "Gnosis" refer to a family of religious movements which claimed to possess secret knowledge (gnosis). Another important movement from the ancient world was Hermeticism or Hermetism. Both of these are often seen as precursors to esoteric movements in the scholarly sense of the word. Non-Western traditions can also display the characteristics of esoteric movements. The Ismaili Muslims also stress a distinction between the inner and the outer. It is believed that spiritual salvation is attained by receiving the 'Nur' (light) through the "esoteric", that is, spiritual search for enlightenment. Ismaili Islam also has some of the characteristics associated with esotericism as defined by Faivre, e.g. the belief in an intermediate spiritual sphere mediating between humans and the divine. In order to distinguish esoteric currents based primarily on sources from late Antiquity and the European Middle Ages, from e.g. Islamic or Jewish currents with similar features, the more precise term "Western esotericism" is often employed. Western esoteric movements in the scholarly sense thus have roots in Antiquity and the Middle Ages. A major phase in the development of Western esotericism begins in the Renaissance, partly as the result of various attempts to revive such earlier movements. During the Italian Renaissance, for example, translators such as Ficino and Pico della Mirandola turned their attention to the classical literature of neo-Platonism, and what was thought to be the pre-Mosaic tradition of Hermeticism. Other pursuits of Antiquity that entered into the mix of esoteric speculation were astrology and alchemy. Beside such revived currents from late Antiquity, a second major source of esoteric speculation is the kabbalah, which was lifted out of its Jewish context and adapted to a Christian framework by people such as Johannes Reuchlin. Outside the Italian Renaissance, yet another major current of esotericism was initiated by Paracelsus, who combined e.g. alchemical and astrological themes into a complex body of doctrines. In the early 17th century, esotericism is represented by currents such as Christian Theosophy and Rosicrucianism. A century later, esoteric ideas entered various strands of Freemasonry. Later in the 18th century, as well as in the early 19th century, the diffuse movement known as Mesmerism became a major expression of esotericism. In the 19th century, esotericism is also represented e.g. by certain aspects of the philosophy, literature and science associated with Romanticism, by spiritualism, and by a notable French wave of occultism. The major exponent of esotericism in the latter part of the 19th century is the Theosophy of H. P. Blavatsky, not to be confused with the Christian Theosophy mentioned above. In the 20th century, Theosophy was reformulated by Annie Besant, C. W. Leadbeater, Alice Bailey, Rudolf Steiner and many others, and became the source for a whole range of post-theosophical movements such as The Summit Lighthouse. A particularly successful post-theosophical movement is Anthroposophy, a synthesis of occultist, Christian and neo-Platonic ideas with Western esoteric concepts as formulated in the wake of Theosophy. Anthroposophy, which was founded by Rudolf Steiner in the early part of the 20th century, includes esoteric versions of education, agriculture, and medicine. Yet another notable esoteric strain stems from the teachings of G. I. Gurdjieff and P. D. Ouspensky. Theosophy is also considered a major influence on the many less institutionally organized varieties of esotericism in metaphysical milieus, "Ascended Master Activities", and within the New Age. Finally, it can be noted that Carl Gustav Jung, can be seen as an exponent of esotericism: his writings concern esoteric subject such as alchemy, and rephrased the concept of correspondences in a modern, psychologizing terminology in his theory of synchronicity. Its beginnings have long been a matter of controversy and are still largely a subject of research. The more these origins are studied, the farther they seem to recede in the past. To make an accurate assumption of the tradition's origin (and therefore age) it would be necessary to study the origin of the various systems which have come to make up the tradition. Of these systems the Egyptian and Hellenic Mystery religions, the Hebrew Kabbalah, Gnosticism and Hermeticism are generally considered the oldest, though at no stage prior to the 1880s were these doctrines ever synthesized into one whole. In all cities of the ancient world were temples for public worship and offering. In every community also were philosophers and mystics, deeply versed in Nature's lore. These individuals were usually banded together, forming seclusive philosophic and religious schools. The more important of these groups were known as the Mysteries. Many of the great minds of antiquity were initiated into these secret fraternities by strange and mysterious rites, some of which were extremely cruel. Alexander Wilder defines the Mysteries as "Sacred dramas performed at stated periods. The most celebrated were those of Isis, Sabazius, Cybele, and Eleusis." After being admitted, the initiates were instructed in the secret wisdom which had been preserved for ages. Plato, an initiate of one of these sacred orders, was severely criticized because in his writings he revealed to the public many of the secret philosophic principles of the Mysteries. Every pagan nation had (and has) not only its state religion, but another into which the philosophic elect alone have gained entrance. 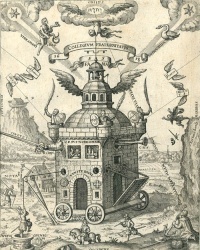 After the fall of Rome, alchemy and philosophy and other aspects of the tradition were largely preserved in the Arab and Near Eastern world and introduced into Western Europe by Jews and by the cultural contact between Christians and Muslims that occurred due to the Crusades and the Reconquista. The 12th century saw the development of the Kabbalah in medieval Spain. The medieval period also saw the publication of grimoires which offered often elaborate formulas for theurgy and thaumaturgy. Many of the grimoires seem to have kabbalistic influence. Figures in alchemy from this period seem to also have authored or used grimoires. The Renaissance saw a revival of classical learning, and a revival of ancient and medieval occult practices in particular. Renaissance magic revived the "occultist boom" of Late Antiquity, recovering texts treating Greco-Roman magic and Hermeticism as well as its continuations beyond antiquity in the form of the Kabbalah, alchemy and the medieval grimoires. Renaissance scholarship gave rise to a Christian Kabbalah and later (in the Baroque period) to the Rosicrucian Brotherhood. The witch trials in Early Modern Europe are at least indirectly related to this revival of scholarly interest in the occult. The Enlightenment saw another occult revival, perhaps spurred by growing rejection of mainstream religion and increased democracy and freedom of conscience. The period saw the rise of occult fraternities, most notably Speculative Freemasonry and a revived Rosicrucian Brotherhood. Academic interest in ancient mystery cults such as those of Mithras and Dionysus began to develop. Emanuel Swedenborg pulled Christianity in a more mystical or occult direction, and Franz Mesmer provided a quasi-scientific method of thaumaturgy. While both these men had profound contributions to the Western mystery tradition, it appears neither was versed in it. The Count of St Germain, whose life and legends influenced Theosophy, lived during this period. Martinism also arose as an esoteric doctrine, as did various Rosicrucian orders. The late 19th century saw a radical split in the Western mystery tradition. Helena Blavatsky was the main instrument of this, by reinventing the tradition in a system called Theosophy. Theosophy largely ignored the medieval traditions, such as alchemy, thaumaturgy and Kabbalah, instead focusing on more ancient mystery teachings and incorporating Eastern systems of yoga. The extant tradition prospered alongside Theosophy, especially under the influence of the Hermetic Order of the Golden Dawn and Ordo Templi Orientis and such teachers as Eliphas Levi, Papus, Samuel Liddell MacGregor Mathers, and Aleister Crowley. This tradition began to see itself as a complete alternative to Christianity, and, not surprisingly, began to emphasize theurgy. This occult revival lasted through World War II. Aspects of it were further revived in the 1960s. Theosophy is still available through the Theosophical Society, and Western theurgy strongly influenced the development of neo-paganism. Emergent occult and esoteric systems found increasing popularity in the early 20th century, especially in Western Europe. Occult lodges and secret societies flowered among European intellectuals of this era who had largely abandoned traditional forms of Christianity. The spreading of secret teachings and magic practices found enthusiastic adherents in the chaos of Germany during the interwar years. Many influential and wealthy Germans were drawn to secret societies such as the Thule Society. Thule Society activist Karl Harrer was one of the founders of the German Workers' Party, which later became the Nazi Party; some Nazi Party members like Alfred Rosenberg and Rudolf Heß were listed as "guests" of the Thule Society, as was Adolf Hitler's mentor Dietrich Eckart. After their rise to power, the Nazis persecuted occultists. While many Nazi Party leaders like Hitler and Joseph Goebbels were hostile to occultism, Heinrich Himmler used Karl Maria Wiligut as a clairvoyant "and was regularly consulting for help in setting up the symbolic and ceremonial aspects of the SS" but not for important political decisions. By 1939, Wiligut was "forcibly retired from the SS" because of his institutionalisation for insanity. Little information is known about the status of the Western mystery tradition in the officially atheist Soviet Union and its "satellites" during the ruling of the Communist Party. It is believed by some that the Soviets had a scientific interest in subjects traditionally studied by the Western mystery tradition, such as telepathy and astrology. A number of people associated with mysticism chose to leave the countries where Communism was installed. For example, G.I. Gurdjieff, an influential individual from Armenia, fled to France after the Bolsheviks overtook the ruling of Russia. The Universal White Brotherhood of Bulgaria, founded by Peter Deunov and extended by Omraam Mikhael Aivanhov, also chose to continue its activities in France and other Western countries after World War II and the introduction of Communism into Bulgaria. Nicholas Roerich, founder of Agni Yoga had also left Russia after the revolution - he and his family first settled in Finland and India - and finally in the United States. These three examples, although not directly associated with the core of the Western mystery tradition, demonstrate a pattern which supports the claim that the Soviet-controlled states were negative not only to mainstream religion but also to mysticism and occultism. It is known that after the dissolution of the Soviet Union, several mystical societies, such as the Rosicrucians, gained profound revival in Eastern Europe and Russia which resulted in the foundation of many new jurisdictions and lodges. Today, the tradition is experiencing a revival in North America and Europe, while many organizations of Western Esotericism (or Wesotericism) have a presence throughout the world. The tradition is now undergoing reevaluation by the anthropological and archaeological developments in the study of its root sources, namely, Ancient Egypt, Mesopotamia and the Greco-Roman world, Druidism and other pagan sources, as well as Abrahamic (Judeo-Christian-Islamic) esotericism such as Manichaeism, Sufism and Sikhism. The early incorporation of Eastern ideas began, most notably, by the Theosophical Society in the 19th century, continues increasingly today particularly from Buddhism, Bon, Jainism, Hinduism, Taoism and especially Yoga & Tantra. Today, Western Esotericism is a syncretism of ancient philosophy, Paganism and Abrahamic thought and imports from Asia and modern science. The tradition focuses on individual spiritual progress through initiation, either personal or into a brotherhood, on personal or group rituals, study of philosophy and "cosmic" laws and their practical application, and encompasses alchemy, meditation, divination, and ritual magic. The concept of initiation plays a very important role in the Western mystical tradition, and many people participating in this tradition are initiated in one or more mystical organisations. Initiatory societies existed in ancient Greece and ancient Egypt, working as schools or colleges for the spreading of their secret teachings to worthy individuals. These teachings were not accessible to the general public, symbolized by the Greek phrase "Ουδείς αγεωμέτρητος εισείτω" (which may be translated as "no person without knowledge of Geometry should get in") found in Plato's Academy. The tradition of initiation and secrecy is well preserved today, although it is criticised by many people, mainly those related to the New Age phenomenon, where many participants have adopted the view that access to knowledge should be as open as possible. However, many New Age schools and doctrines still require a process of initiation and the private tutelage of a guru, as with many forms of yoga) or other enlightened master (e.g., Zen Buddhism) in order for the passing of wisdom or knowledge to occur. Beginning in the early to mid-Nineteenth century, and with the incorporation of Eastern mystical concepts into the existing traditions, the Western mystery tradition experienced a major divergence between the esoteric Hermetic rites of the Masonic and Rosicrucian traditions, and the Theosophical schools (with the major divergence occurring during the life of Madame Blavatsky). Some people considered Theosophy to be grouped under the general rubric of New Age spirituality although others do not agree, since they consider the New Age as an over-simplification of several theosophical concepts and having self-centered aims. The New Age schools preached an openness not seen in the esoteric Hermetic fraternal organizations, which continue to rely heavily on initiatory rites for the dissemination of spiritual information. However, although New Age spirituality is more open in its presentation, it continues to rely more or less on a syncretic and esoteric methodology in the formulation of its methods and in the transmission of its wisdom/enlightenment. With the enormous variation of beliefs and methods among the proliferating spiritual and esoteric groups have come concerns from some regarding the moral quality or ethical content of certain doctrines. As a consequence, there has been an effort by some to attempt a supposed objective dichotomy between the ethical philosophies of spiritual or religious groups by categorizing them under the Left-Hand Path and Right-Hand Path modality. Those on the "Right-Hand Path" are said to focus on the elevation of the spiritual over the carnal, faith-based worship of something greater than themselves, and the observance of strict moral codes, all of which are supposed by their adherents to bring humans closer to the Divine or a moral good, as opposed to those on the "Left-Hand Path" who focus on the advancement and preservation of the self, glorification of the earthly, and the development of personal power. This usage of terms, however, is invoked almost exclusively by proponents of groups who consider themselves "on the Left-Hand Path"; opponents of this terminology (groups that are almost always described by those who subscribe to this distinction as being on the "Right-Hand Path") argue either that this distinction is invalid because it results from a mislabeled or false dichotomy, or that much of what is called "left-handed" is simply not "legitimate". The Catholic Encyclopedia, Volume VI. The Secret Teachings of All Ages by Manly P. Hall ISBN 1-58542-250-9. The Occult Philosophy in the Elizabethen Age by Frances Yates ISBN 0-415-25409-4. The Inner West: An Introduction to the Hidden Wisdom of the West by Jay Kinney ISBN 1-58542-339-4. Three Books of Occult Philosophy: A Complete Edition by Heinrich Cornelius Agrippa ISBN 0-87542-832-0. Unless indicated otherwise, the text in this article is either based on Wikipedia article "Western esotericism" or another language Wikipedia page thereof used under the terms of the GNU Free Documentation License; or on original research by Jahsonic and friends. See Art and Popular Culture's copyright notice. This page was last modified 19:31, 27 February 2016.